Background Obesity has reached pandemic levels with more than 1.4 billion adults affected worldwide. While there is a need to systematically develop and evaluate community pharmacy based models of weight management, it is imperative to describe and understand the perspectives of pharmacy staff. In the UK, trained and accredited community pharmacy medicines counter assistants (MCAs) are commonly the front line staff involved in patient consultations and sale of over-the-counter medicines. Objective To explore the beliefs and experiences of pharmacists and MCAs in the North-East of Scotland on community pharmacy weight management. Setting All 135 community pharmacies in the North-East of Scotland. 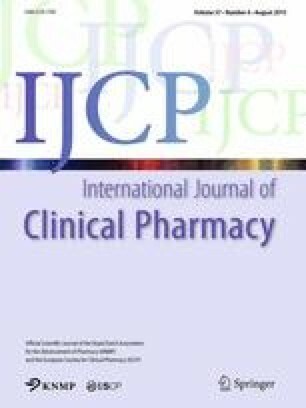 Method A qualitative approach of semi-structured telephone interviews with 31 pharmacists and 20 MCAs in the North-East of Scotland. The semi-structured interview schedule was developed with reference to key domains describing professional practice (i.e. awareness and knowledge, skills, practicalities, motivation, acceptance and beliefs) and contextualised with policy documents and published research on community pharmacy based weight management. Interviews were audio-recorded, transcribed and analysed thematically. Main outcome measure Pharmacists’ and MCAs’ beliefs and experiences with delivering weight management services in community pharmacy. Results There were mixed responses from pharmacists and MCAs around pharmacy based weight management services from positive views of providing the service in community pharmacy to those more reticent who would always favour patients visiting their physician. While all described similar services e.g. measurement of weight, healthy eating advice, supply of products, they acknowledged that support was often opportunistic at the request of customers, with little integration of other providers. Roles described varied from pharmacist only functions to any staff member. While pharmacists generally felt comfortable and confident, MCAs gave more diverse responses. Both Pharmacist and MCAs highlighted the need for a practice model which is systematically developed and suggested a scheme akin to the successful smoking cessation 12-week nicotine replacement therapy service already available in community pharmacies in Scotland. Conclusion Pharmacists and MCAs interviewed in this study reported their perceptions of benefits to providing community pharmacy based weight management as part of a wider public health function. They described services as opportunistic and customer driven based on ease of access. There was a notable variation in pharmacist and MCA training, reflected in their levels of comfort and confidence. There is a clear need to systematically develop and provide evidence of effectiveness and cost effectiveness for a pharmacy based practice model with key roles and functions for the full pharmacy team. We would like to acknowledge the input of D Pfleger to pharmacy recruitment; F Galvin, J Gall, M Gillan, S Grant, L Baxter, D O’Sullivan, E Pumayi, A Reid, C Reid, J Robertson and H Thompson for assistance with data collection; and all pharmacists and MCAs who participated. The study was funded by the School of Pharmacy and Life Sciences, Robert Gordon University, Aberdeen. World Health Organisation. Media centre, obesity and overweight. Fact Sheet No. 311. 2011. http://www.who.int/mediacentre/factsheets/fs311/en/index.html. Accessed 20 Jan 2015. The Organisation for Economic Co-operation and Development (OECD). Obesity update. 2012. http://www.oecd.org/health/49716427.pdf. Accessed 20 Jan 2015. National Obesity Observatory. The economic burden of obesity. 2010. http://www.noo.org.uk/uploads/doc/vid_8575_Burdenofobesity151110MG.pdf. Accessed 20 Jan 2015. World Health Organisation. Global Action Plan for the prevention and control of non-communicable diseases 2013–2020. 2013. http://apps.who.int/iris/bitstream/10665/94384/1/9789241506236_eng.pdf?ua=1. Accessed 20 Jan 2015. The Scottish Government. Obesity Indicators 2013: monitoring progress for the prevention of obesity route map. 2013. http://www.scotland.gov.uk/Publications/2013/11/4898. Accessed 20 Jan 2015. NHS Health Scotland in partnership with the Improvement Service, Scottish Government and COSLA. Elected Member Briefing Note No. 9. The obesity time bomb: Why it’s everyone’s business. 2011. www.improvementservice.org.uk. Accessed 20 Jan 2015. The Scottish Government. Obesity route map action plan, version 1.0. 2011. http://www.scotland.gov.uk/Resource/Doc/346007/0115166.pdf. Accessed 20 Jan 2015. NHS Scotland. Keep well Scotland. 2006. http://www.keepwellscotland.org.uk/stories/index.aspx. Accessed 20 Jan 2015. Department of Health. A new national template for commissioning NHS health checks from community pharmacy. London: HM Government. 2009. http://www.evidence.nhs.uk/search?q=nhs%20health%20checks%20pharmacy&ps=20&s=Relevance. Accessed 20 Jan 2015. Scottish Public Health Network. SOAR2 Project Working Group. Scottish obesity action resource—update. 2012. http://www.scotphn.net/projects/previous_projects/scottish_obesity_action_resource_update_soar2/. Accessed 20 Jan 2015. Medicines Counter Assistant Training. http://www.pharmacyregulation.org/education/support-staff/medicines-counter-assistant. Accessed 20 Jan 2015. National Institute for Health and Clinical Excellence. How to change practice. 2007. http://www.nice.org.uk/Media/Default/About/what-we-do/Into-practice/Support-for-service-improvement-and-audit/How-to-change-practice-barriers-to-change.pdf. Accessed 20 Jan 2015. The Scottish Government. A vision and action plan for the right pharmaceutical care through integrated partnerships and innovation. 2013. http://www.scotland.gov.uk/Resource/0043/00434053.pdf. Accessed 20 Jan 2015. Medical Research Council. Developing and evaluating complex interventions: the new Medical Research Council guidance. http://www.mrc.ac.uk/documents/pdf/complex-interventions-guidance/. Accessed 20 Jan 2015. Community Pharmacy Scotland Smoking Cessation Service. http://www.communitypharmacyscotland.org.uk/nhs-care-services/services/public-health-service/phs-smoking-cessation-service/. Accessed 20 Jan 2015.